Found Dr. Roksar while looking for a dentist near my job and was quite impressed with the service. Timely with theappointments and a friendly staff that always remember my name. Great communication, always get a call a couple days before the appointment as a reminder and Dr. Roksar before doing anything always spends the time explaining what and why he is doing something. Has an office with up to date technology, I was particularly impressed with the 3D scannig. Appointments have been painless as you also get a pre-anesthesia for the anesthesia. Dr. Roksar is my “go to” dentist and I highly recommend him. Found Dr. Roksar while looking for a dentist near my job and was quite impressed with the service. Timely with the appointments and a friendly staff that always remember my name.Great communication, always get a call a couple days before the appointment as a reminder and Dr. Roksar before doing anything always spends the time explaining what and why he is doing something. Has an office with up to date technology, I was particularly impressed with the 3D scannig. Appointments have been painless as you also get a pre-anesthesia for the anesthesia. Dr. Roksar is my “go to” dentist and I highly recommend him. I saw Dr. Rokhsar to replace a "leaking" filling that I had originally been placed c 1980. Understanding that I hada business meeting following the appointment, Dr. Rokhsar administered just enough anesthetic to negate any pain during the procedure, but little enough to wear off within a very short time after the replacement filling was placed. The experience was outstanding - he's not only a great clinician, but he and his staff had a great bedside manner that really put me at ease. I saw Dr. Rokhsar to replace a "leaking" filling that I had originally been placed c 1980. Understanding that I had a business meeting following the appointment, Dr. Rokhsar administeredjust enough anesthetic to negate any pain during the procedure, but little enough to wear off within a very short time after the replacement filling was placed. The experience was outstanding - he's not only a great clinician, but he and his staff had a great bedside manner that really put me at ease. Dr. Roksar obtained his dental degree from Columbia University and received his specialty certificate in Prosthodontics from the University of Medicine and Dentistry of New Jersey. 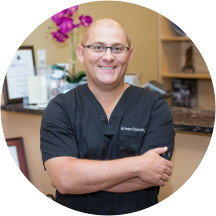 He specializes in advanced cosmetic and restorative dentistry with an emphasis on personalized care, from first visit to perfect smile. Dr. Roksar’s top priority is relationships. He works side-by-side with every patient to create a comprehensive, life-long plan to preserve and beautify both teeth and gums. Whether that dental care plan consists of simple fillings or advanced crowns, bridgework, and implants, Dr. Roksar’s cosmetic and prosthodontic dentistry looks and feels real – and every procedure is performed with real care for the unique needs of the patient. Great visit. He was very friendly, direct and addressed my issues completely. Will be going back. Great as Always. Staff is friendly. Efficiently run office. Great doc. Great overall experience!!! From the front office, to the dental cleaning and the Doctor himself. The hygienists were very friendly and thorough. Dr. Rokhsar eased my concerns and answered my questions. Dr. Rokhsar and his staff are wonderful. Dr. Rokhsar is uniquely helpful about all matters related to oral health, even sleep apnea. Great Dentist & wonderful caring staff. Dr Rokhsar is a very a knowledgeable & caring dentist. He is very patient & makes you feel comfortable & at ease. I am so happy to have been referred to Dr. Rokhsar. Dr. Arman Rokhsar is a wonderful doctor. He is very caring & professional. He takes the time to carefully exam mouth, gums & teeth with X-rays & to determine necessary treatment. While under his care, he is concerned for your comfort. His staff is outstanding. Very responsive and thorough in his explanation regarding needed procedure. Highly recommend. It's the first time that I'm being treated by a dentist and I don't get hurt! Highly recommended. I had some discomfort with a tooth and wanted to be sure I was in good hands since I've just moved to NYC. Dr. Rokhsar was such a kind man and made me feel at total ease. I also happened tobe running behind due to train delays and the staff was so understanding and accommodating. I look forward to seeing this Dr. and staff again, even though i'm terrified of dentists! Fantastic! He was highly recommended and for a good reason! Very happy with my visit! It was wonderful. This was my first Zocdoc appointment and it went as smooth as possible! Dr. Rokhsar was excellent in everyway. Super friendly and true professionals. Really loved my experience and these guys know what they are doing. Highly recommend. I've been going to Dr. Roksar (not Rokhsar) for 7 years. Always a good experience with him and his friendly staff. Helpful and Informative. Dr. Rokhsar has been my dentist for many years, and I highly recommend him. He's not only a great dentist, but also a nice person, and he takes the time to explain everything. I actually look forward to my check-ups! Was good - re-did a filling that another dentist had not done well, and was quick and easy. Definitely switching to Dr. Rokhsar as my regular dentist! Great Dentist, pleasant and competent staff. Satisfied patient for 15 years. Very patient. Answered all my questions. Gave good recommendations on work to be done, not just the most expensive treatment. . . looking to help me, not to make the most money. Made me feel very comfortable even though it was my first visit with him. Highly recommend him. Dr. Rokhsar is a nice guy, good dentist and prompt. He listens to concerns and answers them thoroughly. I have had a "permanent" retainer repaired by him, a new crown done and a filling. His assistant is also very professional, friendlyand welcoming. I have no complaints about the office-only compliments! The doctor was kind, patient and professional. He answered my questions and explained things that I did not know and had not occurred to me. He is by far the best dentist I have known. He does the procedures in an efficient and painless manner and even follows up to check on progress. I have been Dr Roksar's patient for over 10 years and find him to be highly professional, experienced, and approachable. Dr. Rokhsar is so patient and calm, bringing you a strong sense of calm as the patient. He always makes sure you're comfortable, and his work is perfection! Coming to NY Dental is a very pleasant experience, which I never thoughtI'd say about a dentist! I would and do recommend Dr. Rokhsar to anyone who's looking. Straight up! Honest. Good listener. Provides options. Dr. Roksar is taking care of my husband’s and my own dental problems since opening his private practice in 2000. Thanks to his professionalism and dedication he substantially prolonged the life expectancy of our teeth and we can enjoy eatingsteaks, raw carrots and apples. At ages 70 and 77, we are both convinced that Dr. Roksar, with his high-tech approach and first class staff, helped us tremendously to enjoy a painless old age. Dr. Roksar is an excellent dentist. Efficient. Thorough. He explains everything. He is always checking to see that you are comfortable. His office is very comfortable. The staff is helpful and easygoing. Highly recommended. The word is quickly spreading around that Dr. Rokhsar is simply the Best, but don't tell anybody, so the waiting time doesn't get impossibly long. The doctor and his staff made a very strong first impression on me. I've only been treated by him once but so far it's been the best experience at a dentist I've had in several years. Looking forward, but not that forward, to going back. Dr. Rokhsar and his staff are really terrific. You can tell he really cares about his patients. He takes time to go over everything and recommends the best options for both simple and complex matters. He's been a godsend resolving issuesthat handfuls of other dentists couldn't help me with. I'm really thrilled to have found him and finally have a home dentist. Dr.Rokhsar in my opinion was very personable.I would, never thought this was my first time having an appointment with him.It seem like I knew him already.Very informative and I really feel he has the patients, best interest. That was one of the best dental experiences that I ever had. Dr. Rokhsar was very professional and personable. Explained everything and made me feel extremely comfortable. Staff was great and the hygienist was phenomenal.. I am going back and would recommend him highly.